Microscopes - our three Zeiss Universals (Tall, Dark, and Handsome) are equipped with motorized XYZ stages from Applied Scientific Instrumentation, as well as Sony IEEE1394 digital cameras with 1280x960 resolution. Slide Handler (not yet online) : A robotic slide handler with a 600-slide capacity is currently in its final prototyping stages. We plan to build a slide handler for each of our three microscopes, resulting in access to a total of 1800 slides. Click here to see a photograph of Michael Connolly's first prototype; please note that the current slide handler has changed quite a bit from these homespun beginnings :-). Additional I/O: 8-port PCI RS-232 serial card from ByteRunner for hardware device control, OHCI-compatible FireWire card for camera interfaces. BayTech RPC2 for automatic illumination control. Mass Storage - Quantum SnapServer NAS; 480GB with RAID5 protection, for archiving image stacks. Designed in-house, the iScope server software allows control of an arbitary number of attached microscopes. "Users and groups" authentication model with separate access rules for each microscope. When a microscope is idle, the system keeps the microscopes busy acquiring image stacks for remote stereology. Incorporates fiducial information from the Mouse Brain Library to ensure alignment between video and navigational aids. Simple graphical user interface for scheduling time on the system, controlling microscopes, and doing stereology on previously acquired image stacks. Available for Linux and Windows 98/2000/NT/XP/ME. Michael Connolly (left, handsome) wrote the iScope server software and Gumbo, the client software for controlling iScopes. 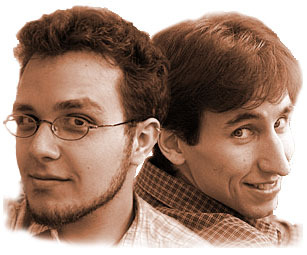 Tony Capra (right, dashing) wrote Aria 3-D, the client software for online stereology, and helped to develop the iScope client-server protocols. Christopher Vincent (not pictured, mysterious) implemented the scheduling in Gumbo and squashed the great onslaught of bugs.